Sophie Treadwell’s 90-year-old Broadway play “Machinal,” about the struggles of a young woman, is coming to Hope Theatre at the University of Oregon this winter, but with a contemporary twist. Directed by UO theater arts doctoral student Ellen Gillooly-Kress, the production of “Machinal” will feature a feminine-aligned cast and use recorded projections to bring the set alive on stage. In addition to the contemporary cast, the actors’ faces, bodies and costumes will be projected on stage. Willamette University visiting assistant professor and UO graduate Chelsea Couch is leading the projection design, which will involve two projectors and prerecorded content of the actors in costume from this summer. Working with projections on stage, Gillooly-Kress said, requires a tedious attention to detail and staging. Since she proposed the play a year ago, more than 60 people have been involved in the production. Audience members can expect poetic language that produces commentary on gender norms in America under a blanket of artistic projections, the director said. 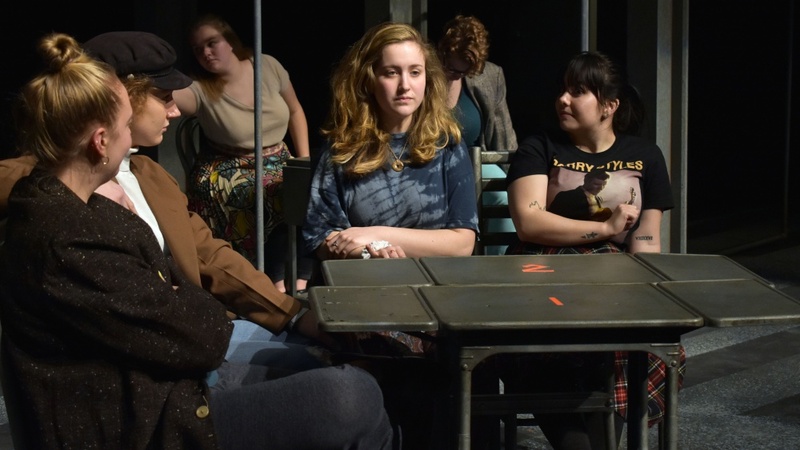 “Machinal” will be performed Jan. 25, 26 and Feb. 1, 2, 8 and 9 at 7:30 p.m. with a Sunday matinee at 2 p.m. Feb. 3. Immediately following the Sunday matinee a graduate student talk will be hosted by Gillooly-Kress featuring graduate students Ricardo Friaz, philosophy; Emily Beecher, sociology; and Elisabeth Fairchild, theater arts; and Couch. Gillooly-Kress also recommends audience members be 13 and older due to scenes of intimacy, relationship issues and implied sexual violence. Students can expect to see two projected promotional pieces for “Machinal” on the walls inside the Erb Memorial Union in the coming weeks. Tickets are $10 for adults and $8 for seniors, students and UO faculty members. Students can get in for free by visiting the box office with their UO ID one hour before the show. To learn more about the show or to purchase tickets visit the UO ticket office website.